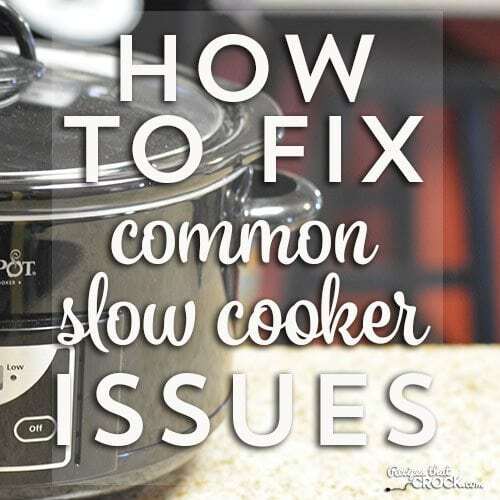 How To Fix Common Slow Cooker Issues - Recipes That Crock! Does this sound familiar? You go and dig out your slow cooker from the closet/cabinet or you buy a new one fancy one from the store and you buy all your ingredients. Then one morning before you leave for the day you throw that great new recipe in and come back after work and it is overcooked or bland and looks nothing like the picture… Frustrating, isn’t it? Most likely you have got one or more of a couple issues going on. The truth of the matter is a lot of our slow cookers cook hotter than some recipes intend for them too. And, over-cooked food tends to break down, lose flavor or dry out and just turn into a hot mess. cRockin’ Tip: If you are constantly finding your food to be over done and/or dry, try cooking your recipe on low, but using the high cooking times. A lot of times that will fix the issue and your chicken will go from chalky to perfectly juicy and delicious. Some slow cookers will have a hot spot or tend to cook faster on one side or area than another. This can cause troubles when cooking up more casserole-like dishes (like our yummy “baked” mac and cheese or corn casserole) or baked goods (like our caramel pecan rolls, french toast casserole or crustless pumpkin pie) especially. cRockin’ Tip: If you tend to have this issue, you can help alleviate it some by rotating your crock inside your slow cooker a few times throughout cooking just like you would rotate your cookies in an oven that cooks hotter on one side. Does this Recipe Make My Crock Look Big? Slow cookers cook best when at least 2/3 full. Given that a lot of slow cookers come in 6 quart models and even some upwards of 8 quart models, that delicious Spinach Artichoke Dip recipe or ooey gooey Caramel Dip may not even fill it half way up. Much like baking a cake in a huge pan, your food will cook a lot hotter and faster if the crock isn’t at least half full. cRockin’ Tip: If you find that your slow cooker isn’t at least half way full, you will need to reduce your cooking time and/or use a bowl or casserole dish inside your slow cooker to make your cooking vessel smaller. I use this medium bowl every single time I make our favorite overnight Apple Cinnamon Oatmeal. The trick is to place your bowl or dish in your slow cooker and pour water in you crock until it reaches about halfway up the outside of the bowl or dish you have placed inside. Don’t add too much or the water will boil over into your food and drown the dish. We hope this post has helped solve some of the slow cooker issues out there. In the coming weeks, we hope to share with you a little more behind the scenes cRockin’… everything from tips to our favorite slow cooker features! Stay tuned! I love my two crock pots. I have a question, though. My oval Hamilton Beach model stains easily. I have tried blue Dawn dish washing liquid. I have tried various plastic scrubbing pads, but can’t get stains off. It’s usually when I cook soup beans over night. Anybody know how I can better deal with my stains. I love my Crock Pot. Afraid to try abrasives on it. Thank you. Is it a ceramic crock? I would try Bar Keeper’s Friend I think. Good luck! Hi- I read that you said to use low setting at high time periods if your foods dry out. I typically do use low setting, but I’m afraid to plan ahead for shorter time only to find out at dinner time that my food isn’t cooked through. Also, how is is that I see pictures of sliced roasts when mine always fall apart (pork or beef)? Thank you! If you are really concerned, I would try cooking a new recipe some time when you aren’t on a time constraint and can watch it closely and then make note of the timing for future use. Another recommendation would be to use a meat thermometer so you can see how far along it is in the cooking process while it cooks. I just love the kind that lets you put the probe inside the crock and set a heat timer on it. Along those lines, that is also how you get sliceable meats. Fall a part meats have been cooked longer than sliceable ones. If you want to try some sliceable recipes, I would recommend choosing naturally tender cuts (pork tenderloin for example) and using a meat thermometer to cook it until it is done (pork = 145 degrees) and then continue cooking while checking it regularly for the tenderness and texture you desire. Then make a note of the size of your meat and the time it took for future use. Hope that helps! Thanks for taking the time to help us fix any slow cooker problems we may have. I have owned a Crock-Pot ever since they first came out. Every few years I find myself buying a new one. Larger or one colored to match my kitchen at the time etc. This time, for the first time ever, I recently bought a Hamilton Beach. So we’ll see, so far I love it. I kept my old Crock Pot so that I can use it at the same time if need be. Love recipes. Hi Nancy! So glad you are enjoying your slow cookers! I too LOVE to cook multiple dishes at the same time. I just love cooking our main dish in one and a side in another! I appreciate the tips. About cooking too hot, even when cooking on low 6-8 hours some recipes will still be over-cooked. Crock pots are intended to be a fix-it-and-forget-it type of appliance, especially for those working and are gone for 8 or more hours at a time. I have 4 different crock pots, 2 older “barrel type”, 1 older oblong 6 qt and 1 new programmable 6 qt. The programmable one will switch to the warm setting after the cooking time has been reached. Even the warm setting is too hot and dries out the food. It is almost like the “old” low setting. Next time I will try your dish tip and see if that helps and maybe try cooking on the warm setting when I am able to keep an eye on it the whole time. Just wanted to share my experience with you and see if you have any additional tips to share. Thanks much! Hi Teresa- I too am frustrated with the disappearance of the convenience of the fix it and forget it way of doing things. The dish inside of the crock is the best way I have found to slow things down– and I too agree that the warm setting can oftentimes do more damage than good. I even know people that have started taking their slow cookers to work to turn them on and off there. While that is not an option for everyone, it is a solution for some. My only other suggestion would be to get a smaller 4 qt crock pot and use larger recipes in it to fill it all the way up and prolong cooking times. Hope that helps. Hi Debbie- So glad you love the site! If you struggle with dry chicken I would say make sure that when you try a new recipe for the first time to make sure and do it when you are able to watch it closely and note how long your slow cooker takes to make it. Cooking times will always vary based on slow cooker age, size and shape. I have had chicken be totally done in 2 hours before, so you can imagine if I had let it go 6 hours it would have been a hot mess ;)If you still struggle to get it just right, I would highly recommend a meat thermometer they really are useful to help you start getting your timing right for your slow cooker. I love the kind that lets you put the probe in your meat inside the crock and set an alarm to go off when it hits your desired temp. Hope that helps! It would really be helpful if you would include crock pot size, especially for soups. Most of our new recipes (I’d say from the last 6 months or more) all include a section called Slow Cooker Recommendations at the bottom of every recipe that shares what slow cooker we used and the size we used. I had 3 Crockpot brand slow cookers that all boiled my food on the “low” setting. I got on line and found that lots of others had the same issue. I changed to a different brand and have had nothing but success since then! I’d love to tell you the brand I have now, but I might be suspect as an employee! Linde- I’d love to hear your experience. No need to not tell the brand here ;). I’d love to know what brand, too! do you have recipes for cooking for one with a small size crock pot with 2 settings? I have the lunch crockpot, and I love it for reheating leftovers at work without having to wait in line for the dirty shared microwave. If you have the same one, it won’t cook any food. It heats food to a certain temperature, then cycles off and back on. It keeps the food at a safe temp, but doesn’t get hot enought to cook anything. I have a 2 quart crockpot which I initially bought for heating dips, but I love it for cooking 2 boneless chicken breasts. I can put in 2 frozen breasts, with whatever seasonings or sauces, on low for a full work day ( 7:00am- 4:00pm) and the chicken is ready to shred and serve on buns, in tortillas, etc. Have you found a particular brand of slowcooker runs hotter than another? In my experience, age of the slow cooker has been more of a factor than brand. I own all different brands and my new ones all cook hotter than my older ones I got from my mom. Thank you for the answer…and most of mine are the older ones, due to my age, but because of you I did purchase the casserole crockpot. Keep up with your wonderful recipes and great tips! Oh I just love that crock pot! Good choice! The casserole c/p is my favorite of all my c/p’s also. I use my older c/p to cook up ? potatoes to fry up for breakfast. You and Miley need to make a cook book. ?.It would be a great seller I am sure. I have a basic Hamilton Beach model that is about 5 years old, and it definitely runs hotter than the GE model I had previously.